SOUTH CAROLINA'S conservative Republican governor, Nikki Haley, is the daughter of Sikh immigrants from Punjab. 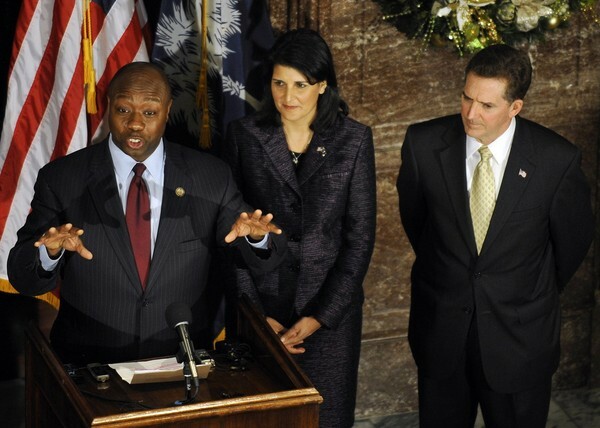 US Representative Tim Scott of Charleston, a Tea Party hero who was raised in poverty by a divorced single mother, is South Carolina's first black Republican lawmaker in more than a century. To anyone who shares the ideals that animate modern conservatism "“ limited government, economic liberty, color-blind equality "“ it stands to reason that Haley and Scott are conservatives. And their Republican affiliation should surprise no one familiar with the GOP's long history as the party of minority civil rights. But many people aren't familiar with that history. So relentlessly have liberal propagandists played the race card over the years that virtually anything conservatives or Republicans do "“ from opposing Obamacare to tweaking the president's fondness for golf -- somehow gets twisted into proof of racial malice. So when Haley announced last week that she would appoint Scott to the US Senate seat being vacated by Jim DeMint, who is leaving to take a job at the Heritage Foundation, I indulged in a bit of preemptive snark.